Hind-leg shaking in horses may be caused by conditions ranging from cold temperatures to serious conditions needing immediate veterinary attention, like equinemMotor neuron disease, equine protozoal myeloencephalitis, fibrotic myopathy, stiff-horse syndrome and equine polysaccharide storage myopathy. Other disorders associated with this symptom are locking of the patella and colic. Tying-up is a generic term used to describe equine muscle disorders. It is also known as exertional rhabdomyolysis, azoturia, or shivers. Symptoms include shaking legs, reluctance to move, muscle cramps, stiff gait, profuse sweating, accelerated heart rate and increased respiratory rate, and dark urine. Symptoms often follow a period of intense activity. Causes include vitamin E or selenium imbalances, electrolyte or hormonal imbalances, hypothyroidism and muscle ischemia with lactic acidosis. Some breeds prone to tying-up are quarter horses, thoroughbreds, Morgans and Arabians, draft and warmblood horses. Shivers is a chronic neuromuscular disorder characterized by periodic involuntary spasms of the muscles in the pelvic region, hind legs and tail. Mild symptoms show hind-leg shaking and sudden jerky limb movements causing the tail to lift. In more severe cases the horse will exhibit spasms of the hind legs, which often freeze and tremble in mid-step for up to several minutes. These symptoms can be observed most often when the horse is prompted to back up or move suddenly. Stringhalt causes a horse to rapidly raise and hyperflex one or both hind legs while moving through its gaits. Severity ranges from mild muscle spasms to much more animated and jerky spasms and hind-leg shaking that can cause the horse to kick his abdomen inadvertently and violently return the hoof to the ground. Nerve damage in the legs, spinal cord, or brain is thought to be the cause. Equine motor neuron disease appears to be the result of damage to the motor neurons supplying the muscles and can be related to imbalances between pro-oxidants and anti-oxidants in the blood. 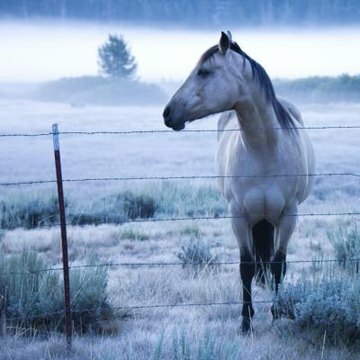 EMND often occurs in horses and ponies subjected to confinement in barns or areas with lack of grazing combined with a grain-heavy diet and poor-quality hay. Horses kept in these conditions are likely deficient in vitamin E. Symptoms of EMND can include muscle weakness, trembling and shaking of legs, loss of muscle mass, buckling of limbs, reluctance to stand, odd posture with weight shifted toward rear of horse, lying down, elevation of tail and respiratory distress. Equine polysaccharide storage myopathy is characterized by skeletal muscle dysfunction and caused by the inability of the horse's body to utilize carbohydrates in its feed. Symptoms are muscle weakness, difficulty moving forward, sore back, abnormal gait with or without lameness, poor attitude, muscle depletion, stiffness and hind-leg shaking or trembling. EPSM is the most common cause of hind-leg shakes in horses. A veterinarian can determine the cause of a horse's hind-leg symptoms via observation and lab tests. The vet will develop a treatment plan accordingly. Some treatments involve surgery and/or medication, while others require stall rest or a change in activity or diet. In order to give your horse the best chance of recovery or relief, consult a veterinarian.